U.K. retailer Carphone Warehouse has jumped the gun a bit and already listed the LG Nexus 4 for pre-order with a delivery date of Oct. 30. While it has been widely expected that Google will announce the LG Nexus 4 and Android 4.2 Jelly Bean at its Oct. 29 event in New York City, the proof got a little deeper today as Carphone Warehouse prematurely put the device up for pre-order on its site. The listing doesn’t give too many new details beyond the confirmation of Corning Gorilla Glass 2, an “amazing 260-degree camera” and confirmation of Android 4.2 continuing on with the Jelly Bean moniker. Sadly only an 8GB version is listed with no signs of a 16GB iteration as of yet. 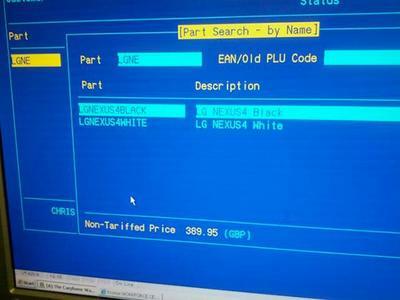 No price has been shown as of yet, but The Verge received a picture of what it believes to be the Carphone Warehouse inventory system showing a price of £389.95 (approx. $629.30 USD). The only issue is this screen shows both black and white options for the Nexus 4 while the pre-order on the site shows only the black. Perhaps the white is coming later. TechnoBuffalo will be live from the Google event on Oct. 29, so be sure to tune in for all of the coverage!